Diane and I met at Marshall University in Huntington, West Virginia. We both earned two degrees there. Our son Ryan is a junior at MU. 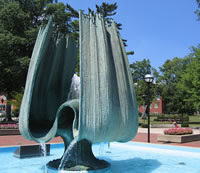 Marshall University is a substantial part of our lives. If those connections weren’t enough, on November 14, 1970, a day that the MU football team was returning from an away game, I was living in Huntsville, Alabama, where I had gone shortly after my discharge from the U.S. Air Force. A friend, David Champagne, had invited me to join him in his hometown to try to get a band going. When I heard the news of the plane crash that claimed all 75 aboard, my thought turned to a cousin, Donna Jean Sutherland, Cokie. Cokie was more than a cousin, she was much like the sister I never had. She lived with us for a few years during high school. Cokie was married to Jim “Shorty” Moss, the offensive coordinator for Marshall, and they had a two year-old daughter, Andrea. I knew Shorty, as he spent some time in our town and at my high school before joining the MU coaching staff. I liked him. He was a great guy. He died in the crash. It was a dark day for her and for me, and for Huntington. “We Are Marshall” is a movie not about the people who died in the crash, but about how the MU football team rose from the ashes. Ryan, Diane and I saw the movie on Sunday; it was very well done; it was a good story.